CHRISTMAS WITH THE MORMON TABERNACLE CHOIR returns for its 15th year on Monday, December 17 at 9:00 p.m. with Tony Award winner Sutton Foster as this year’s guest musical artist and Hugh Bonneville, star of PBS’ own MASTERPIECE “Downton Abbey,” reading the Christmas story from the Book of Luke. Award-winning chef Lidia Bastianich hits the road to discover how small-town Americans celebrate the season in LIDIA CELEBRATES AMERICA“A Heartland Holiday Feast” on Tuesday, December 18 at 9:00 p.m. 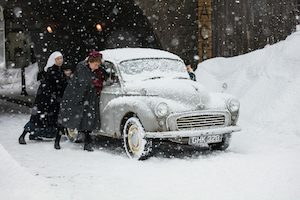 The CALL THE MIDWIFE HOLIDAY SPECIAL, airing Tuesday, December 25 at 9:00 p.m. ET, introduces a new nun who comes to Nonnatus House with some unexpected visitors who cause both joy and chaos. PBS rings out the old and rings in the new with two sparkling musical performances. Enjoy New Year’s Eve in New York with LIVE FROM LINCOLN CENTER “New York Philharmonic New Year’s Eve with Renee Fleming” on Monday, December 31 at 9:30 p.m. Then travel to Vienna and toast the New Year with GREAT PERFORMANCES “From Vienna: The New Year’s Celebration 2019” on Tuesday, January 1 at 9:00 p.m., an effervescent evening of music from the Vienna Philharmonic. Programs so delicious, you’ll want a second helping include encore broadcasts of THE GREAT BRITISH BAKING SHOW “Christmas Masterclass” on Sunday, December 16 at 6:00 p.m., with beloved judges Mary Berry and Paul Hollywood. An additional musical delight for the holidays includes an encore of CHRISTMAS AT BELMONT on Friday, December 21 at 10:00 p.m. featuring Grammy winner Sheryl Crow and nearly 700 musicians from Tennessee’s Belmont University. And for viewers ready to unwrap something special, ANTIQUES ROADSHOW “Greatest Gifts,” airing Monday, December 24 at 8:00 p.m., reveals the true value of some memorable presents, from a Tiffany necklace to a Fender bass guitar. PBS KIDS’ holly jolly lineup includes holiday favorites like ARTHUR’S PERFECT CHRISTMAS, THE CAT IN THE HAT KNOWS A LOT ABOUT CHRISTMAS!, CURIOUS GEORGE: A VERY MONKEY CHRISTMAS, PEG + CAT + HOLIDAYS and WILD KRATTS: A CREATURE CHRISTMAS. 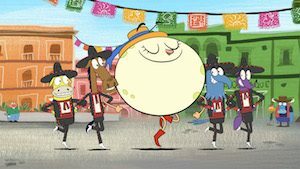 And the newest PBS KIDS program, LET’S GO LUNA!, debuts its very first Christmas special, “Luna’s Christmas Around the World.” When the Circo gets stuck at the South Pole on Christmas Eve, Leo, Andy and Carmen are afraid Santa Claus will never find them. But with help from their friend Luna, they embark on a mission to save Christmas – and learn some holiday traditions from around the world along the way.